God, don't let my brother die at the end of a British rope. Author Pat Kirkham discusses the opening titles for Exodus, from her authoritative book Saul Bass: A Life in Film and Design. In the title sequence, the symbol's boldness is offset by sensual flames that move lyrically around it. The flames burn more and more strongly, and by the final credit consume the screen. Saul stated, "The film is about Israel. In its earlier restricted form, the flame has the symbolic connotation of the Temple and the 'eternal light.' At the end of the title it provides a symbolic forerunner of the struggle for independence which is the main content of the film." The symbol and flames also featured in the main advertising. The invitations to the premiere were literally scorched, as if bona fide evidence of real events. The book published to coincide with the film's release attributes the extraordinary advance ticket sales (in excess of one million dollars two months before the opening) to a series of advertisements designed by Saul. During production the ads appeared in every major newspaper in cities where the film was scheduled to open, setting off "an avalanche of orders." 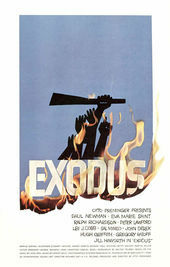 In one ad, the ship Exodus stands for the travels of the film's cast and crew; type is set in the shape of steam rising from the funnel. By contrast, "All Wrapped Up" announced that production was completed and in the can by using a film can and playing with the industry term "It's a wrap."